The canvas was created by the famous artist Van Gogh in 1888. The canvas depicts a small part of the night street, the situation is rather dark, but the artist did not use black paint at all while working on the picture. But even this fact will not force the viewer to believe that the picture is not night. This work was created during the period of Gog’s stay in Arles. This stage of his work is full of yellow colors, with which this artist began to associate. This picture also did not become an exception. If you carefully consider the picture, you can feel this color, feel that it contains bright and warm feelings that come from the depth of the work to dispel everyday worries and turmoil. There is a version that Van Gogh at that time decided to radically change his style in painting. He painted this picture not in the studio, but right on the street at night, he always believed that it was better to paint a picture here and now than to memorize the plot and draw it later, so important details and colors could disappear from the thoughts, without which the picture does not will turn out to be special. It is rumored that the artist used a candle for his work in the night. Of course, there is no evidence for this. There is only one mention of this, found in the artist’s letters. The plot of this picture, many critics and scientists consider similar to the rather well-known picture “Avenue de Clichy, five evenings.” These pictures have a very similar composition. Van Gogh’s canvas looks darker, however, the lighting available in both paintings is also very similar. This picture carries a kind and positive message. Thanks to well-chosen colors, for the image of light, the picture radiates heat, the viewer is pleased to look at it. 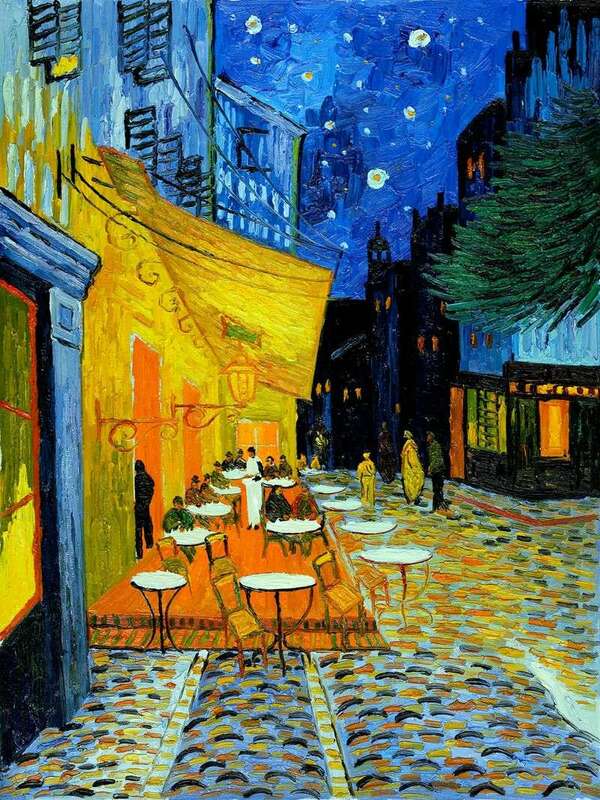 Description and meaning of the painting Night Cafe Terrace by Vincent Van Gogh.